NOTE: Only the Subscriber (the person who signed up) or User license with Admin user group can configure your company details. Configuring your company's details is part of the on boarding steps during sign up, however it is not mandatory. You can update and complete your company's profile any time to help bring up your business details in quotes and invoices. STEP 2 Open the Company settings. 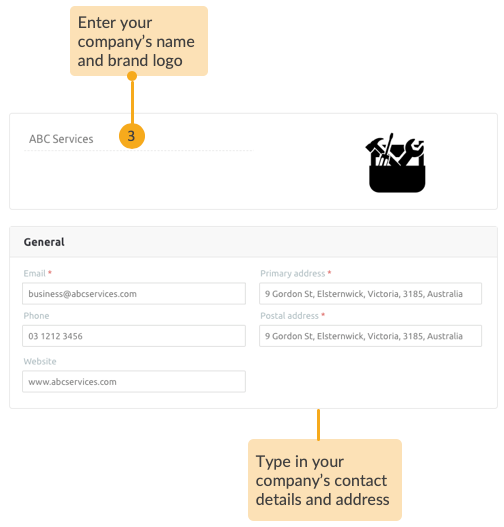 STEP 3 Enter your company's name, upload the company logo and enter your company's general details, particularly, the email address, primary address and billing address. 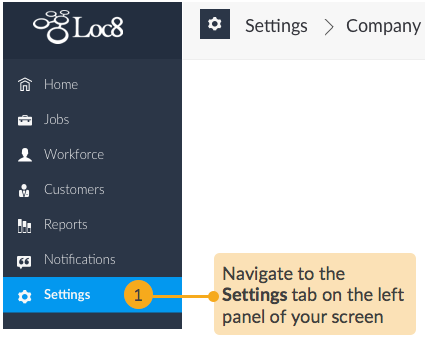 The details entered here will be used on job reports, Loc8-generated emails and so on. STEP 4 Specify your company's operating region, timezone and business hours. The business hours are used to set default times for job and appointment scheduling. If the chosen Timezone is different from your local timezone, you'll find two clocks at the bottom-left corner of your screen; the first shows the local timezone and the second shows the chosen business timezone (which you may also refer to as the server timezone). The same will apply to all other users in Loc8 who operating from different local timezones; they too will see the two clocks on their Home screen. Whenever necessary, you can switch between the two timezones and that will change the timestamp indications throughout your account. 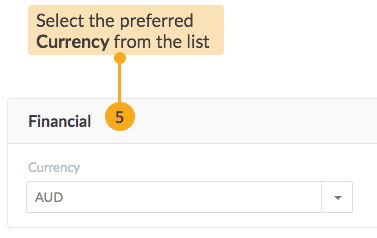 STEP 5 Specify the preferred currency used for all your company's business transactions. The same currency will be used to represent costs, charges and expenses throughout Loc8.